Bumper Kiblo school building block set. Perfect for larger classes or class sharing. Suitable for larger classes and nurseries, or for class sharing. 96 versatile Kiblo building blocks. 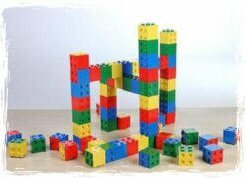 Limitless individual building fun and group construction possibilities. Made with care in the UK.